All week on the OUPblog we will be celebrating the Lincoln Bicentennial. Be sure to check in daily for original posts from Allen C. Guelzo, author of Lincoln: A Very Short Introduction, Jennifer Weber, author of Copperheads: The Rise and Fall of Lincoln’s Opponents in the North, and Craig L. Symonds, author of Lincoln and His Admirals. To start things off we have excerpted from Abraham Lincoln by James M. McPherson. 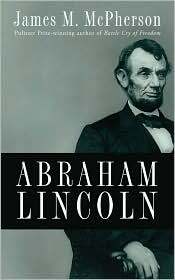 This short book is the perfect biography to kickstart our Lincoln celebrations. The excerpt below begins with Lincoln’s birth, on February 12, 1809. Abraham Lincoln was born on February 12, 1809, in Hardin County, Kentucky, about fifty miles south of Louisville. His father, Thomas Lincoln, had come as a child with his family from Virginia in 1782. Thomas acquired only enough literacy to sign his name but gained modest prosperity as a carpenter and farmer on the Kentucky frontier. He married Nancy Hanks, also illiterate, in 1806. Abraham was born in a log cabin on Sinking Spring Farm three miles south of Hodgenville. When he was two years old the family moved to another farm on Knob Creek about seven miles northeast of Hodgenville. On this farm of 230 acres (only thirty of which were tillable), young Abraham lived for five years, helped his parents with chores, and learned his ABCs by attending school for a few weeks with his older sister, Sarah. In December 1816 the Lincolns moved again, this time to Indiana, which had just been admitted to the Union as a state. The traditional notion that the Lincolns moved because of a dislike of slavery may have some truth; they belonged to a Baptist denomination that broke from the parent church on the slavery issue. The main reason for the move, however, was the uncertainty of the land titles in Kentucky, which caused Thomas to lose much of his property. Indiana offered secure titles surveyed under the Northwest Ordinance. There Abraham learned the use of axe and plow as he helped his father carve a house and farm out of the hardwood forest. The growing youth also snatched a few more months of education in the typical one-room schoolhouses of the frontier. In late 1817 or early 1818 the Lincolns were joined by Nancy’s aunt Elizabeth Hanks Sparrow and her husband, Thomas Sparrow, and Abraham’s cousin Dennis Hanks. Soon thereafter, in the fall of 1818 the Sparrows and Nancy Hanks Lincoln all died of “milk sick,” probably caused by drinking the milk of cows that had grazed on poisonous white snakeroot. After a year of trying to keep house and raise the children by himself, Thomas Lincoln returned to Kentucky to seek a wife. On December 2, 1819, he married the widow Sarah Bush Johnston and brought her and her three children to his farm on Pigeon Creek, Indiana. His stepmother provided Abraham with affection and guidance. With a desire for learning and an ambition for self-improvement, he devoured every book he could borrow from the meager libraries of friends and neighbors. The King James Bible and Pilgrim’s Progress offered him maxims for life as well as a model for the poetic prose that characterized the best of his later writings. Thomas Lincoln neither encouraged nor understood his son’s intellectual ambition; quite the contrary, he chastised Abraham’s “lazy” preference for the reading over working. The teenaged Abraham’s thinly veiled disdain for life of a backwoods farmer doubtless irritated his father. Abraham in turn resented the requirement of law and custom that any wages he earned before he reached the age of twenty-one—by hiring out to neighbors to split rails, for example—must be turned over to his father. Abraham Lincoln’s hatred of slavery, which denied to slaves the “fruits of their labor,” may have been influenced by Thomas Lincoln’s expropriation of Abraham’s earnings. In any event, relations between Abraham and his father grew increasingly strained. When Thomas lay dying in January 1851, he sent word that he wanted to say goodbye to his son. Abraham refused to make the eighty-mile trip, stating that “If we could meet now, it is doubtful whether it would not be more painful than pleasant.” He did not attend his father’s funeral. what is an example of federalism in this book? It is really a huge honor for USA to have had a great and legendary president. And it’s interesting to look at his background. Thank you very much for sharing this very informative post.